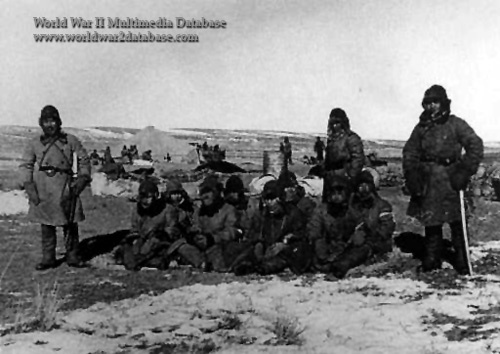 Three Japanese Kempeitai of Unit 1855 guard eight Chinese prisoners during their forced exposure to frostbite. Unit 1855 was a secret Imperial Japanese Army facility that focused on the development of biological weapons during World War II. It was operated by the Kempeitai, the Japanese military police, with the the headquarters in Beijing. Unit 1855 also operated an experimental branch unit based at Chinan, Hopei. The North China Army established Unit 1855 on February 9 1938. The 2,000 soldiers were housed near Bejing's Temple of Heaven. Headed by Imperial Japanese Army Colonel Yeni Nishimura, he reported directly to Major General Dr. Shiro Ishii of the infamous Unit 731. Unit 1855 killed 1,000 people between 1938 and 1945. Eight male Chinese, aging from 15 to 49, were victims of the experiments carried out from January 31 - February 11, 1941 in Inner Mongolia. The men were exposed outdoors to temperatures of about 27 degrees Celsius below zero with some being deliberately wounded or forced to wear wet shoes and clothing. Unit 1855 recorded the victim's reactions. One teenager became "furious" four minutes after the experiment began, wailed 30 minutes later and could no longer feel his feet after one and half hours. Unit 1855's records claimed the experiments were done to learn how to deal with frostbite afflicting Japanese soldiers during the war. The photo was part of unclassified records titled "Results of Japanese Imperial Army Winter Hygienic Research" discovered in Tokyo in 1995.